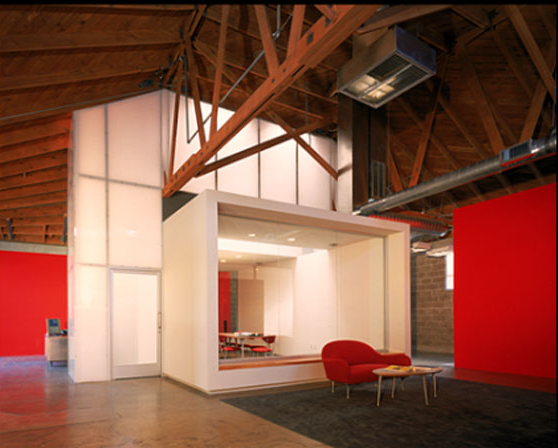 M1 Advertising Agency utilized an open plan design with private areas enclosed with glass. The design utilizes new material such as metal, glass, plastics and laminates, a glass row of offices, engineered with suspended metal frame ceilings and enclosed with glass walls and metal frame doors. A conference room, engineered with metal stud framing. A light shaft draw light from the skylights above into the conference room space with obscured 6 mil twin wall lexan [plastic sheeting]. Wrapping the entire structure. This room has two glass walls with views into the library area. The library is made with maple veneer, with a clear finish. Workstations are built from metal framing with a yellow painted drywall surfaces. Partition are capped with maple veneer shelving units. Used of brilliant colors brings this space to life.